BUENOS AIRES, Aug 7 2007 (IPS) - Above and beyond the political rhetoric in favour of South American integration, Mercosur and Venezuela have not eliminated their mutual suspicions, which are delaying Venezuela’s admission to the trade bloc as the fifth full member, a move that was announced with great fanfare in late 2005. “The trade liberalisation programme that Venezuela has to negotiate with the members of the bloc has moved forward with Uruguay and Paraguay, but the discussions have ground to a standstill with Argentina and Brazil,” Eduardo Sigal, the Argentine Foreign Ministry’s under-secretary of economic integration in the Americas and Mercosur, told IPS. The process has stagnated due to political and economic reasons, said Sigal, who is representing Argentina in the negotiations for Venezuela’s admission to Mercosur (Southern Common Market), which was created in 1991 by Argentina, Brazil, Paraguay and Uruguay. Venezuela does not want to continue the negotiations on trade issues until the parliaments of Brazil and Paraguay ratify its application for full membership, as the legislatures of Argentina, Uruguay and Venezuela have already done. On the other hand, Caracas “is closely scrutinising” the impact that the influx of products from Argentina and Brazil will have on agriculture and industry in Venezuela once its tariffs have been phased out and economic integration begins in earnest, said Sigal. The constant calls for regional integration voiced by the presidents, and especially Venezuela’s Hugo Chávez, gave the impression that the incorporation of the new member would be a simple matter. But instead it has turned out to be a complex process that at times appears to be on the verge of collapse. 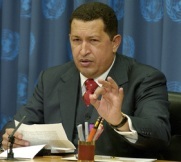 With the hope of jump-starting the process, Chávez is currently making a brief visit to Argentina and Uruguay. In Buenos Aires on Monday, Chávez and his Argentine counterpart Néstor Kirchner signed an agreement for the construction in Argentina of a regasification plant for liquid natural gas from Venezuela. The Venezuelan leader also offered to purchase 500 million dollars in Argentine debt, a transaction to be completed on Friday, when the two presidents meet again in Bolivia. From Argentina, Chávez headed to Montevideo to meet with Uruguayan President Tabaré Vázquez. It was in the Uruguayan capital that a Mercosur summit approved Venezuela’s request in December 2005 to join the bloc. Six months later, the leaders signed the protocol that would enable Venezuela to become a full member, which has been approved by the parliaments of Argentina, Uruguay and Venezuela. “Chávez has pointed to resistance in Brazil – not by the government, but by the right, which is exercising pressure from parliament,” said Sigal. “The same thing is happening in Paraguay, but with one aggravating factor,” he added. Although Paraguay’s governing Colorado Party holds a majority in Congress, the ratification of the protocol has fallen hostage to a political climate in which many factions are seeking to undermine the image of President Nicanor Duarte, just a year before elections. Against that backdrop, said Sigal, Chávez has decided to make it clear that “until Brazil and Paraguay deal with this issue in Congress, Venezuela will leave in place the ‘economic complementarity agreement’” that has governed trade between Mercosur and Venezuela, plus Colombia and Ecuador, since 2004, said Sigal. That agreement could remain in place indefinitely, but if the members want Venezuela to join the bloc, the process must pick up speed. According to Sigal, Venezuela has already reached agreements with the four full members as to how it will adopt Mercosur’s common foreign tariff, has accepted the bloc’s rules, and has agreed on a trade liberalisation programme with Uruguay and Paraguay. And although it still has time until September to reach similar agreements with Argentina and Brazil, the talks “are not moving along yet,” he added. However, “The incorporation of a country into a free trade zone is not something that is arranged overnight,” said Sigal. “The discussions focus by turn on different production areas, and timeframes are negotiated, depending on the sensitivity or competitiveness of each sector in terms of enduring an eventual flood” of imports. “That is why it is being careful to keep Argentina and Brazil from flooding it with products,” he said. Does that mean Venezuela did not take into account such implications when it requested to join the bloc? asked IPS. “Yes, it did, but it put a greater accent on social aspects and integration in terms of productive partnerships,” he said. “In Chávez’s view, the Mercosur of the 1990s was overly trade oriented, and he sees the bloc as having a different, broader focus, which Argentina coincides with. But there has been resistance – not from the governments, but in this case from the congresses of Brazil and Paraguay,” said Sigal.